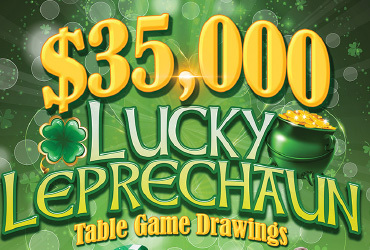 In March, players have a chance to win even more with our $35,000 Lucky Leprechaun Table Games Drawings. Lucky guests can win their share of the $8,000 guaranteed weekend prize pool every Friday & Saturday night at 9 p.m. Table games players can earn one entry for every hour of $10 play, or equivalent, and can start earning entries on Friday, February 26. Visit the Resort Rewards Club for complete details.